Conway Twitty had 55 #1 hits. He left millions of fans all over the world. Mike Walker brings Conway back to the stage where Conway was most adored and remembered. 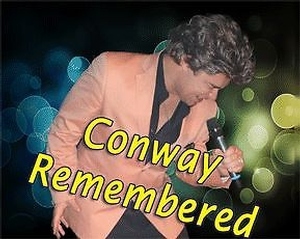 "Conway Remembered", reflects Conway Twitty live in concert. Mike Walker and The CT Band give a performance that will make you remember Conway as the Country Music icon that he was. Mike gives Conways music the complete viger that Conways music demands. Mike has studied Conways manorisms and vocal ability to the max. When Mike finishes his tribute, it will leave people wondering how anyone could incompus someone elses character and voice so closely. Mike gives the ultimate Conway experience. Join Mike Walker and his CT band as they take you back through Conway's 35 year country music legacy! Mike puts his heart and soul into every song just like Conway did 20 years ago! Performing Conway's songs like "Hello Darling", "Slow Hand", "Don't Take It Away", "Tight Fittin' Jeans", "After The Fire Is Gone", "I May Never Get To Heaven", just to name a few! Get your tickets for this great Branson show!